D16 has teased the news that it's about to release a new version of the multiband distortion plugin Devastor. First reviewed in 2008, the Devastor was originally a super-charged version of the distortion unit featured in D16's Phoscyon synth. Having been a staple distortion for some time now, it seems the D16 group deems it worthy of a reboot. Devastor 2 will be gifted with some new features, including a Signal Routing Selector, which replaces version one's pre/post filter switches, giving more efficient control over the processing path. D16 is sure this will offer some new and previously unachievable signal topologies. The built-in Limiter should help prevent drastic changes in the audio output's amplitude, as well as making the sound more vivid and juicy. And the redesigned Filter Model should provide a more analogue feel to the plugin. Finally, there is the improved Dynamics Flattener, which promises a punchier, in-your-face sound. 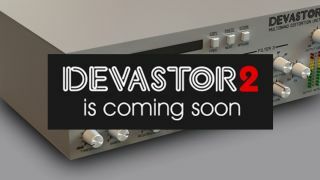 Devastor 2 is going to be available in VST, AU, AAX and Rack Extension formats. Check out the D16 website for more news.